Tesla dipped its toe into advertising this year, but in the form of an amateur video ad contest suggested by a 10-year-old. Tesla CEO Elon Musk stressed this week that the electric car maker is not spending much to market its Model 3, a sedan the company is counting on to enter the mainstream. "We're not promoting the car," he said on an earnings call Wednesday. "If you go to our stores, we don't even want to talk about it, really, because we want to talk about the thing that we can supply. If somebody orders a Model 3 now, it's probably late next-year before they get it." But even as the Model 3 goes on sale for anticipated delivery starting in the fourth quarter, word-of-mouth and free media coverage seems to be enough to fuel demand for the foreseeable future. Consumers have put down deposits on about 455,000 of the cars so far. That dynamic presents a unique challenge to established automakers, which eclipse Tesla in total sales but advertise massively to maintain market share and, increasingly, to seed demand for their own fledgling electric brands. Nissan in 2016 spent $4.3 million in measured media on its electric Nissan Leaf, including on a print ads early last year that took on Tesla. By contrast, Tesla spent nothing, according to Kantar. For the first seven months of 2017, Nissan sold 8,531 Leaf vehicles, up from 6,856 in the year-earlier period, according to data compiled by the Automotive News data center. General Motors spent $3.7 million in measured media on the Chevrolet Bolt electric vehicle for the first three months of 2017, according to Kantar. Through July, Chevy sold 9,563 Bolts, according to Automotive News. The hatchback originally went on sale in California and Oregon in December before more states were added. It will go national this month. "I don't expect that Tesla will have to spend a dime on advertising anytime soon," said Michelle Krebs, a senior analyst for AutoTrader, citing the reservations for the Model 3. "It will take Tesla a good amount of time to fulfill those orders even if they are successful with their ambitious launch plan. Tesla, indeed, has built a strong brand that requires little or no promotion for now. Tesla has taken on a life of its own." Tesla dipped its toe into advertising this year, but in the form of an amateur video ad contest suggested by a 10-year-old. It posted 10 finalist videos on YouTube and promised the ultimate winner a free trip to a future Tesla launch event, which is a heckuva lot cheaper than paying an ad agency and buying primetime TV commercials. Musk announced the winner to his 11 million Twitter followers on July 28. The video, by Marques Brownlee, has nearly 1 million views on YouTube. Of course, as Fortune pointed out, Brownlee was already a YouTube star known for tech commentary videos. On Wednesday's earnings call, Musk boasted about the positive media reviews the Model 3 is getting. After a test-drive event for journalists, 80 percent of the participants said they'd buy the car themselves, he said. "This is crazy," Musk said. "I've never seen anything like it." Consider Motor Trend's review, which gushed that "if anybody was expecting a typical boring electric sedan here, nope. The ride is Alfa Giulia (maybe even Quadrifoglio)–firm, and quickly, I'm carving Stunt Road like a Sochi Olympics giant slalomer, micrometering my swipes at the apexes." 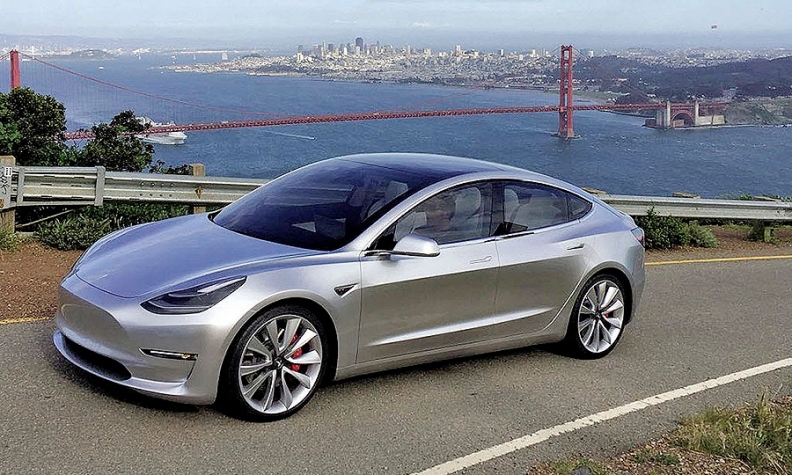 The Model 3 "is so unexpected scalpel-like," it continued, "I'm sputtering for adjectives." The standard Model 3 has a starting pricetag of $35,000 that Tesla hopes will lure a broader range of buyers than its more expensive Model S and Model X.
Tesla began taking $1,000 deposits for the Model 3 last year. It has 455,000 reservations in hand (after cancellations) and is averaging 1,800 net orders a day, according to the company. On Friday, Tesla held a media event marking the delivery of the first 30 Model 3 sedans to company employees. "Last week stressed the hell out of me," Musk said. But, he added, "this is probably the best I've ever felt about the company." There have been 63,000 cancellations of Model 3 orders over more than a year, according to numbers Musk shared Wednesday. But he called the numbers "inconsequential." "With a small amount of effort we can easily drive the Model 3 reservation number to something much higher but there's no point. It's like if you're a restaurant and you're serving hamburgers and there's like an hour and a half wait for hamburgers do you really want to encourage more people to order more hamburgers?"